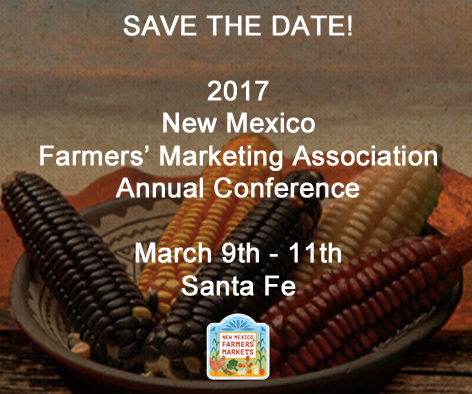 Save the date for the 2017 New Mexico Farmers’ Marketing Association Annual Conference! This year’s conference will take place March 9th through 11th at Santa Fe Community College. Things kick off in the afternoon on Thursday, March 9th for the Double Up Food Bucks workshop. This workshop is mandatory for all outlets wishing to participate in the Double Up Food Bucks program in 2017. The conference formally begins Friday morning, March 10th and runs through late afternoon on Saturday, March 11th. The conference agenda and lodging information are still in the works, so check back as details emerge! Will there be vendor spaces at your conference in March? Hi Kent! This year there will not be vendor spaces (look for that in the 2018 conference). But if you’re interested in other ways vendors can get involved, send me an email at (christina at farmersmarketsnm.org). Do you have to be a current farmers market member to attend? Or would this be a good event for someone wanting to get started with the business and association? Thanks! Do we need to register for this? Where on the Santa Fe Campus will the Double up Bucks workshop take place? Hi Barbara! Enter the front/main entrance to the college, then head towards the bookstore. We will be in the Jemez Rooms.